Trim excess fat and skin from the beef rumps. Cut the pork fat, push the strips of fat through the beef joints using a small sharp knife (this will help keep the beef moist). Put the beef in the marinade and refrigerate for 48 hours. Drain all the marinade and vegetables from the beef and retain. Seal the beef joints in hot butter and oil until well browned. Remove from the pan then caramelise the onion, carrot, celery, shallots and bacon; set aside. In the same pan, caramelise the vegetables from the marinade, pour off excess fat and deglaze the pan with ale, red wine and marinade liquid. Bring to the boil and reduce by half. Strain and discard the vegetables. Put the beef joints in a large casserole dish, pour over the hot liquid and beef stock. Bring to the boil, cover and cook in an oven at 140°C for approximately 4 hours. After cooking, allow to cool in the liqueur and refrigerate overnight. Skim fat from the surface. 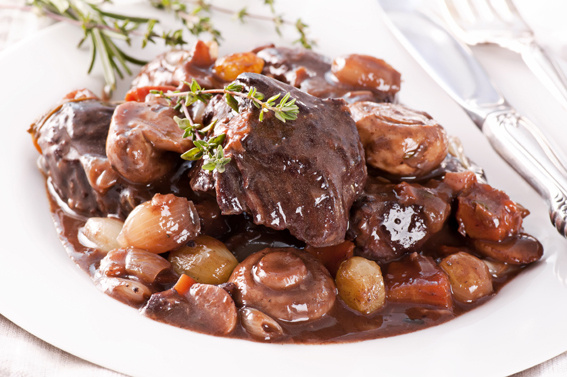 To reheat, remove the beef from the cooking liqueur and place in an ovenproof dish. Pour over a quarter of the cooking liqueur with some of the caramelised vegetables, shallots and bacon. Cover and reheat in the oven at 180°C for 30 minutes, basting occasionally until completely hot (you could use a temperature probe). Simmer any remaining liquid in a saucepan until the required consistency is reached. To serve carve the beef into 4 portions and serve with the vegetables, bacon and shallots garnish. Pour the hot sauce over the meat and serve with creamed potatoes and buttered cabbage.